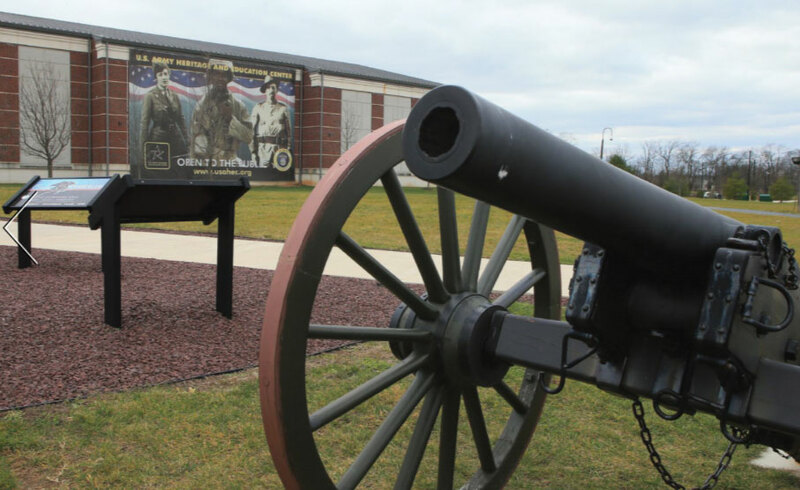 Just 30 miles north of Gettysburg, the U.S. Army Heritage and Education Center (USAHEC), Carlisle, is considered the nation’s leading organization dedicated to educating and preserving the legacy of Americans who have served their country as U.S. army soldiers. The range, depth, and breadth of USAHEC is staggering: a 54-acre site housing 16 million military items (and growing), including what’s considered the world’s largest collection of Civil War photographs with a grand total of 1.7 million military photographs. USAHEC not only includes an indoor museum component, but also outdoor exhibits, and an extensive library, archives, and artifacts collection—all free and open to the public. Stories are at the heart of USAHEC. Touring the main indoor museum, the “Soldier Experience,” presents a unique experience for every visitor. That’s because each visitor picks up a dog tag at the front desk to begin. Exhibits depict the Army’s history, starting with the Spanish-American War, through World Wars I and II, the Korean and Vietnam Wars, culminating with current operations in Afghanistan. Along the way, visitors scan their dog tag to learn their soldier’s story and see how it fits into the nation’s history. Strehl says many visitors actually go through the “Soldier Experience” several times, choosing different dog tags so they can experience several real-life stories. At the exhibit’s conclusion, visitors have the opportunity to write letters to soldiers currently serving in operations. Upstairs, “Treasures of the USAC” is stocked with extremely unique artifacts. Strehl points to her favorite item—a large ledger created during a post-Civil War ceremony held by the Carlisle GAR. “Veterans of the Civil War each filled out a page in the book, writing their memories from the war, why they enlisted—all in their own handwriting,” she says. Annual visitation has grown to 185,000 visitors; Strehl says projections are for 200,000-plus visitors in 2017. The federally-funded museum is also supported by the nonprofit Army Heritage Center Foundation, and employs 85 people in various capacities from those in visitor and education services, to those skilled in archiving, processing, and collections—all under the U.S. Army War College umbrella. 9 a.m levothyroxine synthroid. – 5 p.m. This is USAHEC’s biggest annual event, featuring re-enactors, demonstrations, and lectures; and drawing an average of 5,000 people. The 2017 theme is the Armored Forces and will feature a large number of tanks and maneuvers. Numerous “Perspectives in Military History Lectures and/or Roundtables” are held each month, featuring noted speakers and historians. Visit USAHEC.org to learn more.